f Italy contained only the viticultural resources of Piedmont and Tuscany, that would be wealth enough, but there is much, much more even if a large part of it is too often ignored by an increasingly homogenised wider world. In North-East Italy fine, elegant whites are produced in the Alto Adige and fuller, more concentrated examples in Friuli-Venezia Giulia, from a mix of both local and international varieties. Some of Italy’s finest sweet wines also come from the North-East while all three provinces now also provide highquality reds. While some come from the like of Cabernet Sauvignon, Merlot or even Pinot Nero, more and more outstanding original reds result from a realisation of the true potential of the native grapes: not just Corvina in the Veneto for Valpolicella and powerful Amarone but also Lagrein and Teroldego in Trentino-Alto Adige and even the previously obscure Pignolo and Schiopettino in Friuli. The German-speaking South Tyrol has become a dependable source of elegant, perfumed dry white wines and cool, refined reds. Most of the wines are are labelled as Alto Adige DOC with a varietal name and many of the grapes are familar to wine drinkers. The best examples of Chardonnay, Sauvignon, Gewürztraminer, Pinot Bianco and Pinot Grigio are combine concentration with elegance and are complemented by fine reds from Lagrein, Cabernet Sauvignon and Merlot as well as some genuinely good examples of Pinot Nero. The native Lagrein has emerged over the past decade as a superior grape variety and most of the top producers now offer a premium oak-aged version, often in addition to simpler, supple, spicy, brambly examples. These have powered past existing styles such as Lago di Caldaro/Kalterersee produced from the Schiava grape. At its best it is a light but attractive perfumed red (Scelto, or Auslese indicates a higher degree of ripeness). Santa Maddalena/St. 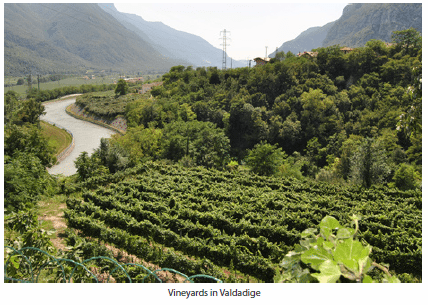 Magdalener is a similar offering from a smaller zone further north, close to Bolzano. Producers fall roughly into one of three categories. First is the significant and high quality output fromprestigious family concerns (not least Lageder, Hofstätter and lately Manincor). Second are the increasingly high profile large co-ops. If quality tended to be consistent but unexciting in the past, many have taken a massive leap forward in the last decade (Colterenzio, San Michele Appiano, Terlano and several others). But try too the wines of a small band of star growers, each with just a few hectares of vines (the brilliant Ignaz Niedrist, Peter Pliger – Kuenhof or Franz Pratzner – Falkenstein, to name but a few). As in the Alto Adige, the regional Trentino DOC covers a wide range of varietals and though the standard is generally lower than in the Alto Adige several small producers signal the quality possible (Cesconi, Pojer & Sandri and San Leonardo shouldn’t be missed). The greatest originality comes in the shape of an excellent red in Teroldego Rotaliano (from the Teroldego grape). Regrettably there are not that many examples yet but the superb wines of Foradori show what is possible with higher-density planting and low yields. The potential of another native variety, Marzemino, remains unrealised but some attractively floral, plummy examples do exist. Though Trentino is a major producer of sparkling wine, few examples of Trento have the quality to compete with the best fizz from around the world (Ferrari’s top cuvée is an exception). The Adige river swings out of Trentino-Alto Adige and turns more easterly as it runs through Verona. On the lowest reaches of the Lessini Mountains to the north are the hills of Valpolicella, merging with Soave to the east. A number of producers have turned their backs on these classic appellations (using instead a regional IGT) as they believe they have failed to shed an image of cheap, simple plonk. In terms of quality wine the international reputation of this noble Italian province has come to depend chiefly on Amarone della Valpolicella. From a still relatively small number of producers, top examples of this powerful red, made from partially-dried grapes, are among Italy’s finest reds. When not fully fermented to dryness this results in the sweeter Recioto della Valpolicella, while amandorlato is sometimes used to describe an in-between style. The biggest challenge for producers of Amarone is to retain some of the typicity of the style while losing the rusticity that has plagued its image. The excessively raisiny character and high levels of volatile acidity have become less apparent as cellar hygiene has improved and more care has gone into eliminating grapes affected by rot. Many are now aged in new oak but whether more modern or traditional in style, Amarone’s strength and character don’t give it the greatest versatility. Fortunately, despite the trend to increased quantities of Amarone, a few producers have radically improved the quality of Valpolicella. Modern producers have thrown out the lesser of the traditional grapes, concentrating on Corvina, but are also introducing small percentages of other grapes – such as Syrah in the case of Allegrini. Most of the best examples have benefited from some sort of enrichment. The technique known as ripasso (the name is exclusive to Masi) involves passing the finished wine over fermented Amarone skins, improving both the texture and character of the wine. Many a producer’s premium version of Valpolicella (sometimes from a single vineyard and usually as Valpolicella Classico Superiore) benefits from it but not all – others directly incorporate a percentage of dried grapes at some point during the fermentation, producing a sort of hybrid Valpolicella/Amarone. The best Amarone need at least 5-6 years’ age and will keep for 10 to 15. Recioto is often better drunk younger but top examples will keep as long. 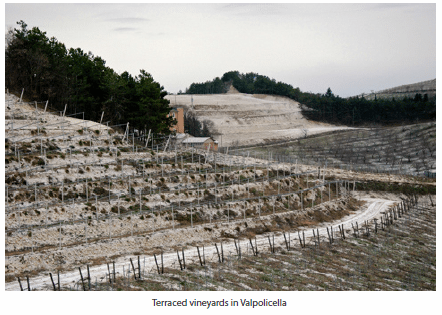 Top examples of Valpolicella generally drink well with 3-5 years’ age but exceptionally will keep for more than a decade. The best recent vintages are 2004, 01, 00, 97, 95, 93, 90, 88 and 85 but from a top producer wines from most other years are also very good. A decade ago finding an example of Soave (DOCG in Superiore) that was more than an anonymous dry white lead to just a handful of producers led by Anselmi and Pieropan. Now excellent examples abound and it can be seen for what it is – a brilliant 21st century white. Lean, lithe yet intense and pure with a herb and mineral-infused singularity, it is also capable of some age in the more structured single vineyard examples. Look for the new breed (mostly 100% Garganega) from Cantina del Castello, Filippi, Gini, Inama, Nardello, Prą, Suavia or Tamellini. Recioto di Soave (also DOCG), the version from dried grapes, although of variable style, from oxidised and raisiny to sleek and fruitfilled, can be an excellent sweet white. Gambellara abuts Soave to the east and is currently most notable for the wines of La Biancara. Bianco di Custoza and Bardolino to the west of Soave, on the eastern and southern fringes of Lake Garda, are sometimes cited as substitutes for Soave and Valpolicella but usually only compare with basic examples of each. From the western shores of Lake Garda one or two producers make quite concentrated, stylish Lugana as well as other blends (that incorporate Chardonnay and Sauvignon in the case of Ca’ dei Frati). North of historic Vicenza is Breganze, which owes its reputation to one producer, Maculan. As well as splendid sweet whites from the native white Vespaiolo, good quality has been realised from Cabernet Sauvignon and Merlot. Vignalta in the Colli Euganei, found south of Padova (Padua), has also been successful with both Merlot and Cabernet but makes good dry whites too. Prosecco is the region’s fizz and from a good producer can be fresh and attractive if drunk young (Adami, Bellenda and Bisol are amongst those recently tasted that offer a bit more). Friuli’s production (like that of Trentino-Alto Adige) is dwarfed by that of the Veneto but there are at least as many top-quality producers. French varieties have been planted for many years in the hilly COF (Colli Orientali del Friuli) and Collio DOCs and DOCGs, but despite the quality of the wines produced from them they fail to give the region a distinctive stamp. Yet beyond Chardonnay, Sauvignon Blanc, Pinot Grigio and Pinot Bianco there are ever-better examples of Friulano (known as Tocai Friulano until 2006), Ribolla Gialla and Malvasia Istriana: wines of distinctive character – and high quality from a top producer. While a good number of the whites are made in the prevalent unoaked fashion, an increasing number of the best wines have added structure from some use of oak. Top Collio names include Borgo del Tiglio, Jermann, Edi Keber, Russiz Superiore, Schiopetto, Villa Russiz, Zuani as well as the extraordinary wines of Gravner. Amongst those from Colli Orientali are Dal Fari, Dorigo, Livio Felluga, Miani, Moschioni, Paolo Rodaro, Ronchi di Manzano or Le Vigne di Zamė. The flatter Friuli Isonzo (or Isonzo del Friuli) has emerged over the past decade as the third major quality zone, led by a young generation of growers making some of the most concentrated and structured whites anywhere in the region. Taste these from Borgo San Daniele, Mauro Drius, Lis Neris, Pierpaolo Pecorari, Ronco del Gelso or the brilliant Vie di Romans. Red wines are increasingly important and with better training, higher-density planting and lower yields the grassy character once common to so many of the reds from Cabernet Sauvignon, Cabernet Franc and Merlot has been replaced by a lush, ripe berry fruit richness in best examples. Also showing much promise in the most recent vintages are some intense and concentrated examples of native varieties, Pignolo, Refosco and Schioppettino (Moschioni is the star). Fine sweet whites are made by several producers from the native grapes Picolit and Verduzzo. COF Picolit is now DOCG (from 2006), complementing the existing Ramandolo DOCG from Verduzzo grapes from the small zone around the village of the same name (try from Dario Coos or Giovanni Dri – Il Roncat). Good wines can also be found beyond the big three of Collio, Colli Orientali and Friuli Isonzo. 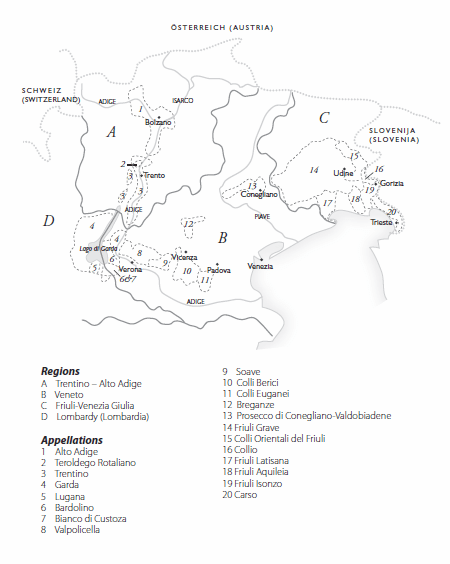 Carso DOC covers wines produced along the thin strip of Italy between Gorizia and Trieste. Known as Karst or Kras it is a continuation of the limestone plateau of south-western Slovenia. In addition to the usual Friuli varietals most producers also make the unusual (white) Vitovska and (red) Refosco-based Terrano/Teran (try from Castelvecchio, Kante, Skerk or Zidarich). Soundly made if only rarely exciting whites and reds are produced in the large, mostly flat zone of Friuli Grave (Russolo) or even the smaller southern zones of Friuli Aquileia (Foffani) or Friuli Latisana.